So I had a customer reach out to me tonight and let me know that they are getting a server offline message from CloudFlare when visiting their site. Immediately, I panicked fearing the web server may be down. Upon investigation I found that the web server was up and humming along happily. I went to the site and found that I was able to access it. Strange. So, I had them test again – same result. As it turns out, the site was being blocked only for visitors in the Seattle Washington / Portland Oregon area. I checked the usual suspects such as fail2ban and apache/nginx but found nothing there (but whitelisted the CloudFlare IP’s for good measure – https://www.cloudflare.com/ips/ ). Scratching my head, I remembered that I have third party WAF rules for mod_security. It is typical to see a lot of blocked IP’s in the logs so I greped the sites apache error_log for the CloudFlare IP addresses and there it was. I excluded this particular signature ID (Not the whole rule) and that did the trick. Lesson learned. 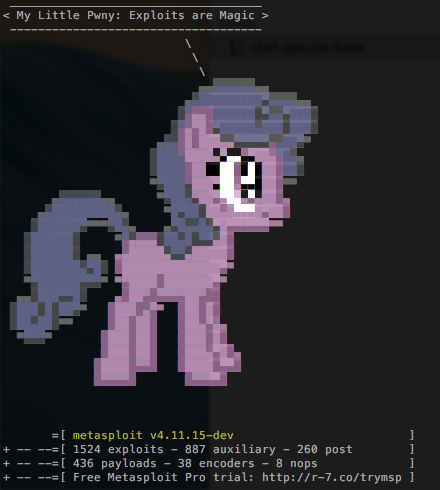 Installed the latest version of metasploit and launched the console and this little gem was displayed. Technology has a hand in everything that we do these days so I decided to write this article about the 5 must have apps that I use daily to manage my life and keep everything in order. The applications listed below keep me productive as well as informed and ahead of my tasks. There are a TON of apps out there that are designed to offer these capabilities but these are the ones that I find most useful. While google is considered by many to be evil due to their information gathering practices, most people find it to be a vital and indispensable part of their daily lives. We all know how useful the search capabilities of Google can be, but the search giant offers far more than just the most handy search on the web. The main features of the Google platform that I find useful are the Apps. Google Apps for Business gives you access to Google Drive for file storage and sharing, Google Calendar for scheduling and organization, Google Docs, Sheets, Forms, Sites and Slides for an online productivity suite and more. Google Apps is also extensible and allows third party developers to integrate additional features and services into the platform. One such integration I find useful is Boomerang, which allows you to schedule emails. All in all, Google and the suite of Apps that are available are arguably the most useful tools available online and that is why they are found at number 1 on my list. Trello is a Board, List and Card (Kanban) system that allows you to create Boards that can represent things like Projects. Within Boards, you create Lists to represent the steps in your project. On each list, you place Cards, which represent individual tasks. Cards can be labeled with colors and include attachments, due dates, checklists and comments. You move cards between lists as they move through your project workflow. I find Trello most useful for organizing my personal life and tracking my progress as I move throughout my day. I like to create a daily task list first thing in the morning of the top 5 or 10 items I want to accomplish that day. I then categorize, prioritize and track progress to completion. This helps me ensure that the important things get done. Overall, Trello rates number 2 on my list due to it’s ease of use and versatility as well as the accompaniment of a handy mobile app. Evernote is an online note taking solution that allows you to take note of just about anything. In your favorite browser, install the plugin to clip articles, or full pages as well as take screenshots and bookmarks. On your mobile device, you can type, hand write, record audio or take pictures as notes. All of this information can be organized into notebooks and tagged for easy searching. Even better, all of your notes are accessible and sync to all of your mobile devices. I find Evernote most useful for noting and returning to items that I want for further reading or for items that I will frequently use (such as terminal commands or a good recipe) that I do not want to have to find again later. I also find evernote extremely useful for note taking when studying or during online classes. Evernote comes in number 3 on my list since it is a great companion app to the previously mentioned as well as being uncannily good at remembering things for me. SOOoo, how did Twitter make it onto my list of cannot live without productivity Apps? Well, if you sort through all of the garbage and use it only for following items that apply to your productivity and interests that pertain to furthering your career or knowledge, it can be pretty useful. Twitter primarily serves as an outlet for useful information that applies to my studies or career in technology. I follow companies like RedHat, Canonical/Ubuntu and DefCon. When a new technology or vulnerability or earth shattering announcement pops up, I am able to act on it quickly and be ahead of the curve. The trick is to not allow the lure of all of the cool information distract you for too long, making it unproductive. Twitter comes in at number 4 because it offers a useful and extraordinarily real-time source of information, while posing a real threat to productivity. Skype is a double edged sword. Interacting with other carbon based life forms can be distracting and detrimental to productivity. It can also be extremely productive and dare I say entertaining. In my experience, the trouble is getting everyone else on a team to use it. My primary use for skype is as you might imagine, communicating with my team. Even when we are in the same room or office, it is a more efficient and faster communications media than picking up the phone or talking because you are able to multi-task more easily while chatting. This is a short article on how to configure Microsoft Exchange Server 2010 Auto Discover feature. I remember when I initially tried to do this years ago, finding any reliable information on getting it working was a challenge, so I decided to write my own basic how-to for anyone else who is facing this dilemma. These instructions should serve as a good starting point/foundation to get Auto Discover configured in your environment. My instructions (Particularly the portion regarding Certificate installation) are based on GoDaddy Certificate services so the instructions may vary slightly from your Certificate provider but most steps should be applicable.